This demographic profile of Dublin highlights general characteristics and trends of the local population, including household size, educational attainment, employment characteristics, commuting trends and general housing types. In addition to these basic indicators of current conditions, projections of population, households and employment are discussed. Throughout this section, 2010 Census data are used where available as analyzed by the City of Dublin and the Mid-Ohio Regional Planning Commission. Dublin has been one of the fastest growing communities in Central Ohio since the 1980s. Its strategic location on I-270, its national reputation for quality residential and employment growth and excellent school systems have all facilitated its rapid expansion. With a growth rate of more than 300 percent from 1980 to 1990, 92 percent from 1990 to 2000, and 25 percent from 2000 to 2010, corresponding increases in housing demand and support services have occurred. Dublin’s population is highly educated, and nearly 65 percent hold employment in management, business and financial operations. Dublin’s proportion of school-age children and persons between ages 35 and 49 remains comparable to many suburban communities in the area, although New Albany has clearly become the regional destination for young families, while Dublin’s retirement age population is growing by comparison. At full build-out, Dublin is projected to have a population of approximately 65,000, not including potential expansion areas to the northwest. The city is also expected to have over 30,000 dwelling units and will be home to approximately 90,000 jobs. Dublin’s existing demographic characteristics combined with projected trends result in a high demand for a variety of housing types and services such as schools, recreation, and general municipal facilities. Dublin residents expect a high level of service with a corresponding quality of life. These factors have attracted many residents and businesses to Dublin and will influence choices about moving to or remaining within Dublin in the future. Demographics for other comparable entities such as the City of Hilliard, the City of Worthington, the Village of New Albany and the Columbus Metropolitan Statistical Area (MSA) as shown in the population growth table below provide a context for interpreting growth trends in Dublin. Hilliard and Worthington are Dublin’s closest suburban neighbors along the I-270 outerbelt. Hilliard, to the south of Dublin, is a fast-growing municipality facing development pressures with substantial areas for expansion. Worthington, to the east of Dublin, is an example of an established, totally developed community. The Village of New Albany is a master planned residential community and employment center located 21 miles to the east of Dublin, and is an example of a rapidly growing, high quality community with development characteristics similar to Dublin. The Columbus Metropolitan Statistical Area is used to show regional comparisons. Additionally, Delaware County, in which a portion of Dublin is located, has experienced substantial growth over the past decade. Dublin’s rapid growth has occurred primarily over the last 40 years due to the availability of public water and sanitary services made possible in the early 1970s with the development of Muirfield Village. 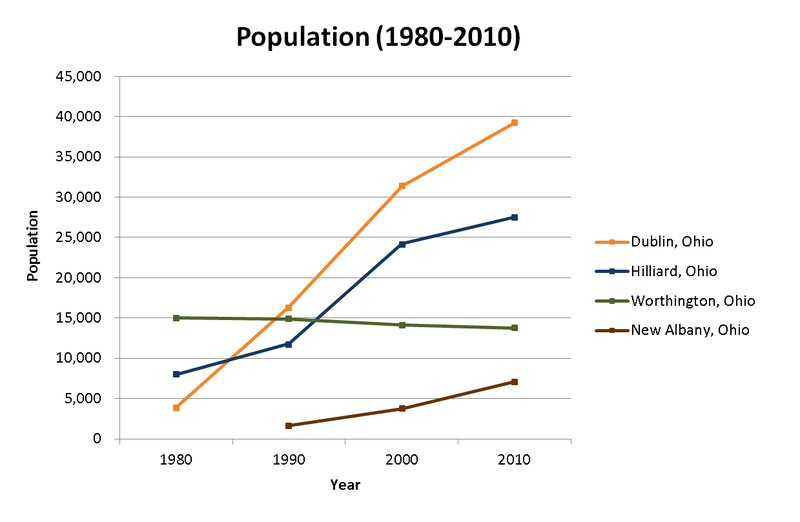 At that time, the Village of Dublin comprised a population of less than 700 residents, and its subsequent growth is charted below from 1980 to 2010. In only a 10-year period, the population increased five-fold to over 3,800 people; by the 1990 Census, Dublin’s population rose by 350 percent to a total of 16,366, allowing Dublin to incorporate as a city after surpassing the minimum required 5,000 residents. Dublin’s rapid expansion continued through the 1990s, expanding through the 2000 Census to 31,392 residents, and to 39,245 residents in the 2010 Census. By 2012, the Mid-Ohio Regional Planning Commission estimated Dublin’s population at 42,038. On average, Dublin has grown by over 1,000 persons per year over the last 30 years. 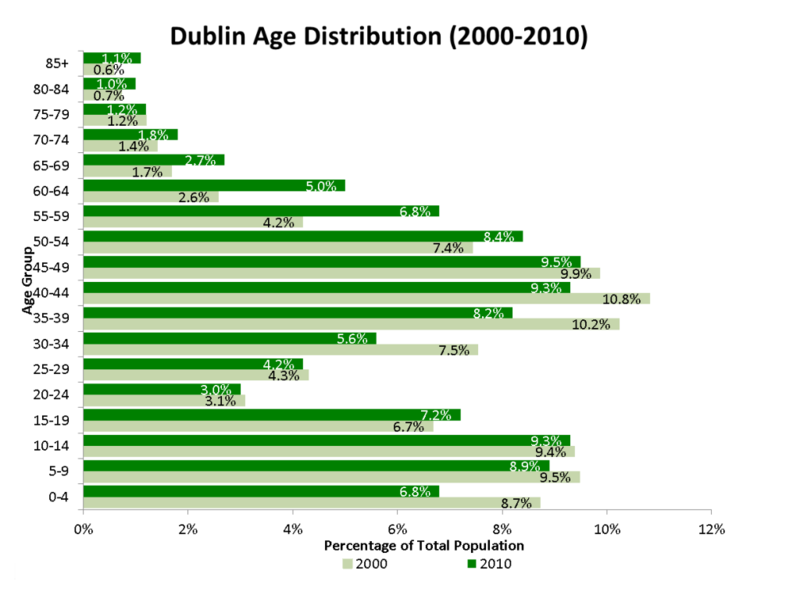 Between 2000 and 2010, Dublin’s population grew by 25 percent. In comparison, Hilliard grew by 14 percent, New Albany expanded by 91 percent, and the Columbus MSA increased by 20 percent. In contrast, Worthington’s population decreased slightly during this period. The rate of household growth in Dublin slowed from 12 times the regional average in 1990, to five times the regional average in 2000, to a little over twice the regional average in 2010. In 1990, Dublin had 5,533 households. This increased by 102 percent in 2000, to 11,165 households, and by 34 percent in 2010, to 14,984 households . By 2012, Dublin was home to an estimated 15,085 households. The size of the Dublin median household, in contrast, changed from 2.96 persons per household in 1990 to 2.81 in 2000 (a five percent decrease). The total decline in household size from 1980 to 2000 equaled 11 percent. From 2000 to 2010, average household size decreased an additional 2 percent, reaching 2.74 persons per household. Dublin, Hilliard and New Albany each have larger households than the Columbus MSA. However, relative changes in household size have varied significantly since the year 2000. Dublin is the only community of the four evaluated to have a decrease, Hilliard showed no change, and Worthington had a slight increase in household size. By contrast, New Albany’s household size increased dramatically during this period, by 11 percent over year 2000 levels. The 2010 Census indicates that 98.3 percent of Dublin residents aged 25 years and older are high school graduates, a 1 percent increase from 2000. This level of educational attainment is somewhat higher than the rates of each of the comparison community except for New Albany. The table below shows the percentage of high school graduates in 1990, 2000, and 2010, as well as rates of college graduation. Dublin had a 70.8 percent graduation rate in 2010, approximately 6 percent above Worthington and approximately 7 percent below New Albany. The types of jobs held by most Dublin residents are indicative of the need for a college education. Unemployment rates for 1990, 2000 and 2010 are shown in the table below. Low unemployment rates are indicated for all four comparative areas, with the lowest unemployment experienced in New Albany and Dublin. The majority of Dublin’s working population consists of managers and professionals. In 2010, nearly 64 percent held managerial, professional, and related jobs, an increase of four percent from 2000. Dublin was only exceeded in this category by New Albany (which has a similar workforce profile), with approximately 70 percent of its workforce in managerial and professional positions. 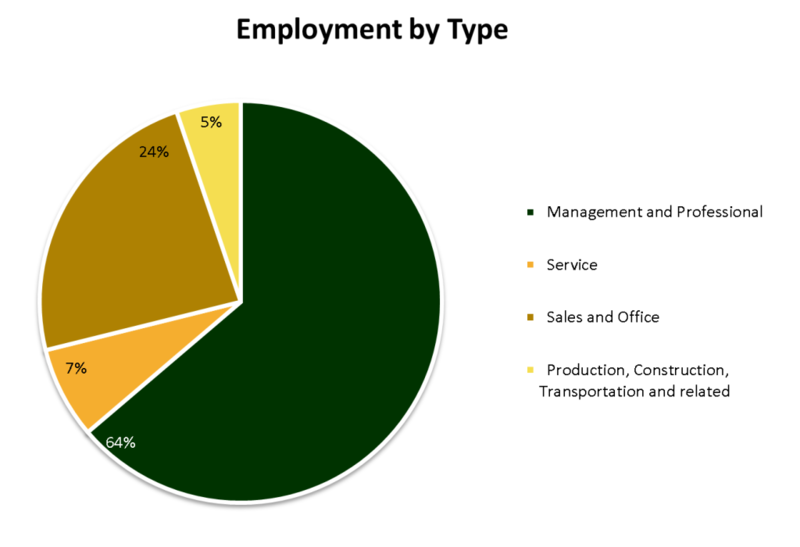 Computer, sales and administrative support occupations accounted for an additional 24 percent of Dublin’s workforce; this was a decrease from 2000, due in part to an increase in the number of construction, production and transportation-related jobs. Dublin has a highly active and mobile suburban population. Serving as a major employer to the Central Ohio region, the city’s daily population increases substantially as workers travel to Dublin’s major employment locations. Estimates place the daytime population of Dublin at approximately 65,000 people, indicating a significant need for transportation infrastructure and daily services. Likewise, Dublin is home to a significant population of highly educated professionals who travel to other employment centers throughout the region such as downtown Columbus. Traveling to and from work, as well as a variety of other activities, the typical Dublin family is estimated by some accounts to make a total of 13 daily trips per household, compared to 11 for other comparable suburbs. The region is highly dependent upon the automobile. More than 86 percent of Dublin’s residents drive to work alone. This rate is similar to single commuter rates in other comparable suburbs and relatively higher than the overall rate of 82 percent for the Columbus MSA. While 1.6 percent of working residents within the MSA use public transit, Dublin’s percentage of transit use is less than one percent. Given the city’s predominately low density development patterns, transit options are currently limited to routes connecting Dublin’s largest employers. As additional jobs are created within the city, and development densities start to increase in strategic areas such as the Bridge Street District, the need to more effectively provide transportation alternatives for Dublin’s major employment corridors will become increasingly important while also more viable due to higher potential ridership rates. As an automobile commuting region, travel times throughout Central Ohio generally range between 21 and 23 minutes. Commuting times for Dublin residents range from under five minutes to over 90 minutes, with an average travel time of 23 minutes. With an estimated 17,599 employed Dublin residents age 16 years and over in 2010, approximately 83 percent work outside of the city. Approximately 41 percent are employed in Columbus, while 55 percent work elsewhere within the Columbus MSA. Less than three percent commute outside the region. Of the total number of jobs within the city, less than ten percent are actually filled by Dublin residents. These figures further highlight the substantial level of commuting into and out of the city and the regional relationships between housing and employment. The age composition of a community provides a basis for evaluating current and future service needs. As shown below, a majority of Dublin’s population is concentrated in both school-age children and adults between 40 and 54. This reflects the predominantly single-family character of Dublin today but also a shift toward a growing middle-aged population, coupled with a much lower component of college-age residents. Between 2000 and 2010, young age groups (0-14) decreased as a percentage of the city’s total population. At the same time, there were substantial decreases in adult age groups between 30 and 49, with even larger increases in the population aged 50 and older. The proportion of families with children is still high for Dublin, with corresponding demand for schools, recreation facilities and other services such as childcare today. Given the significant component of adults age 40 to 54, however, Dublin’s population will continue to age similarly to regional and national trends. As the Dublin population ages, there will be an increased shift in need for senior recreation activities, medical facilities and alternative housing. These trends have significant implications for Dublin’s existing single family housing stock, as described below. Dublin had nearly 15,779 housing units in 2010, and over 79 percent of those were owner-occupied. Dublin’s renter-occupied units totaled 3,122. In comparison, Hilliard and the Columbus MSA have higher rates of renter-occupied housing, and lower rates of owner-occupied housing, while Worthington and New Albany are more reflective of Dublin’s ownership patterns. These ownership patterns correspond closely with the types of housing available in the city. Sixty-eight percent of Dublin’s total housing units are single family detached homes, with an additional 15 percent comprised of single family attached housing products. The remaining 18 percent is comprised of a small number of two-family homes (less than 1 percent) and multiple family units. As Dublin’s population continues to age, the demand for attached and multiple family product types is likely to increase. At the same time, large portions of Dublin’s vast single family housing stock are approaching forty years of age and will require additional maintenance and investments to remain competitive in the housing market. Efforts to attract and retain a younger workforce will also generate demand for alternative housing types, but will also provide an opportunity to build future demand for the city’s traditional housing stock as those workers start families and seek more space. It will be important for the City to continually monitor the status of its older neighborhoods and homes to ensure their continued success. See Land Use Objective 6 for more information.